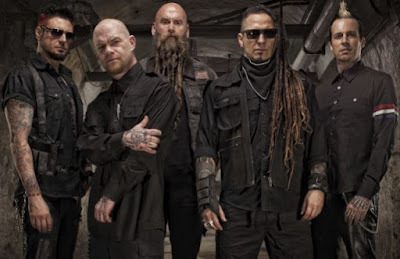 Five Finger Death Punch News: Watch the official video for 5FDP's "My Nemesis"
Watch the official video for 5FDP's "My Nemesis"
Five Finger Death Punch released the official video for "My Nemesis". You can watch the video below. Zoltan Bathory said: "In life everyone has a nemesis… it can be anything… a self defeating thinking pattern, a bad habit, an addiction, an adversary… something or someone that puts you in an impossible scenario, where you are presented with a fork in the road. Sometimes there is no other choice but making a hard choice. You can give up and just suffer the situation, or you can use your pain to overcome it, as pain is truly the wind in the sails of change. We wanted to present a story about moving on, a story that probes and questions compassion and loyalty. Those are beautiful notions, but remember you have to be loyal and fair to yourself as well, so will you sacrifice yourself for another or will you live with the guilt that you didn't."